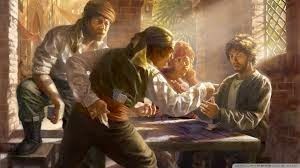 Once in a while when I read pirate fiction, the pirates will be playing poker. This drives me absolutely mad, since the card game poker wasn’t invented until about 1850 (roughly 150 years after the Golden Age). It grew up along the Mississippi river boats, and then spread to the California gold fiends. It is a product of the American frontier. In the early Caribbean, card games were certainly popular, but they were games that had originated in Europe. The cards themselves were very much like the ones we use today. A deck held 52 cards, with the same four suits as our own, and the number 1-10 in each, plus the 3 face cards of Jack Queen and King in each suit. What was not the same was the look of the cards. No one had yet thought of designing the cards so that they looked the same with either end up. 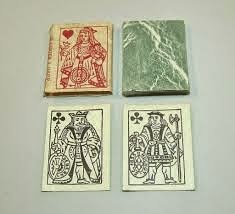 The royal figures had heads and feet, and the “pip” cards likewise had only one “right” way up. The backs of the cards were blank, and the edges were not rounded in the manner of modern cards. Also, they were printed on plain cardboard, without the waterproof coating we expect now. Cards were also much harder to come by. It’s easy to imagine them being dog-eared and dirty. A lonely pirate might pass the time by playing Patience, which was the word used at the time for the game we call Solitaire. The version at the time was the one most likely to be found today on a computer, an arrangement of cards that starts out with seven piles of face-down cards, and ends with 4 piles, face up, each containing only one suit and arranged from ace to king. The classic English game was Cribbage, in almost exactly the same form it is played today. It was descended from an even older game called “Noddy”. Cribbage boards, the scoring mechanism for the game, have been found in the wrecks of pirate ships. Today cribbage is the “official” game of the American submarine service. Seafaring novels set during the Napoleonic wars (1799-1815) often mention the game Whist, a game similar to modern-day Bridge. But this game is believed to have come into being at about 1728 – too late for our period. France, a major player in the Caribbean, was also a major producer of playing cards. Produced a number of famous card games, including Piquet (pronounced P.K.). Piquet was developed at about the year 1500, possibly from an even older Spanish game. It uses a deck of 32 cards, from 7-King in each of 4 suits, plus the Aces, which are high. It is a game for 2 players, each of whom receives 12 cards, and can discard and re-draw to improve their hand. The game then progresses something like Bridge, with combinations being made to score points by "taking tricks." This is a scientific game. It’s possible to figure out exactly what cards your opponent holds by noting your own cards and your opponents’ discards. Possibly because this led to over-confidence, betting sometimes reached fantastical heights. French nobles sometimes wagered whole estates on a single game. Eventually the king of France banned Piquet, though play did not actually die out for another two centuries. This may also have been one of the reasons that pirate ships banned card games except on shore. Of course, there were dozens of other card games. The number of ways that a single deck of cards can be dealt, stacked, combined, spread and recombined in almost limitless variations. 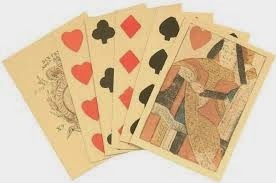 Where today we have a variety of card types (Uno, Go Fish, Old Maid) , in the early 1700’s there was only one basically type of was only one type of deck. The variations were wide indeed. While many card games required “tricks” to be acquired, the Irish game Maw (sometimes rhymed with cow) was a game of discarding. The first person to lay all his cards on the table was the winner. It was, ideally, a five person game. Maw had one other interesting detail. It was against the rules to tell the rules to any other player. The official statement was, “I can only tell you the first rule, and that’s this one.” After that, players needed to figure it out for themselves. The appearance of certain cards reversed the order of play, caused play to skip a player, changed the cards that were “high” or made other changes. If a new player didn’t figure it out he payed a penalty. There are a lot of games that every family should make it as a hobby just like the card games. Click bgames play games free now. These games are exploiting an interesting theme, which is to take the player into the supposedly bad people in the eyes of everyone. Playing a hero who rescues a princess or even rescues the world is probably a familiar scenario with so many titles, but some other titles exploit a rather interesting theme. Put players on the supposed bad guys in the eyes of everyone. Let's go through some of these titles.